Seriously, for a moment yesterday, I worried that we might orphan our children. Instead, I'm relishing my bravery, high-fiving my hubby, and generally feeling like I've earned an extra gardening merit badge. We ate homegrown mushrooms. And they were scrumptious. is phenomenal. But because these logs aren't in a sterile environment, we've also seen other mushrooms showing up uninvited. And those mushroom invaders made me nervous. like shiitakes—clusters of lovely brown capped deliciousness. I just couldn't waste them. Still skeptical, Peter suggested that I send a photo to Mushroom Mountain—just for a confirmation. I'm sure poor Tradd and Olga probably wish they never sold the plugs to this high maintenance mushroom grower wanna-be. Still, they kindly confirmed that the mushrooms were “beautiful” shiitakes, and to go ahead and eat them. The funny thing is—I'm not a huge mushroom fan. Ironic, isn't it? In fact, whenever we eat out, Peter is the recipient of any mushrooms that sneak into my meal. For me, I grew shiitakes to up my gardening ante—embracing the challenge of growing something new, adding a unique crop to my resumé. Plus, Peter loves mushrooms. Now, with three, gallon-sized bags of shiitakes, I've decided it's time for mushroom love. We'll be eating a lot of shiitakes in the next week or two, and I need to stop behaving like a 7-year-old who doesn't want to try new things. One of those per family is enough. While I research recipes, though, I decided to go with an tried-and-true meal for our first homegrown shiitakes. Shiitake, Swiss chard, and bacon quiche. I didn't plan to include bacon, because the shiitakes are savory enough alone. Sadly, though, a friend mentioned bacon—and then I couldn't resist my bacon craving. Bacon, after all, ended my three month trial of vegetarianism. One whiff of bacon frying—and it was all over. There's something amazingly satisfying when you cook a meal composed of ingredients from your garden. Rainbow Swiss chard is both delicious and beautiful, plus the voles haven't decimated it yet like they've brutalized the bok choy. The eggs--only hours old, with rich, vibrant orange yolks. The shiitakes—well, they're the whole point of the quiche, after all. Funky looking and earthy, they emanated a warm, forest aroma. I don't think I've ever smelled anything like it from grocery store mushrooms. Fry bacon until crispy. Remove bacon from skillet, leaving the drippings. Add leek and garlic to hot skillet. Cook until soft, approximately 4-5 minutes. Add shiitake mushrooms, Swiss chard, and bacon to leek and garlic in skillet. Cook until mushrooms and chard are soft, approximately 5 minutes. Add ¼ cup Parmesan and ¼ cup mozzarella cheese to mixture in skillet. Mix into vegetables and bacon until the cheese begins to melt. Place pie crust into pie pan, fluting the edges. Spoon vegetable/bacon/cheese mixture into pie crust, distributing evenly. In mixing bowl, beat eggs, milk, salt and pepper. Pour egg mixture over vegetables/bacon filling in pie crust. Place quiche in oven. Bake for 10 minutes. After 10 minutes, remove from oven and evenly sprinkle remaining ¼ cup Parmesan cheese over the top of the quiche. Return to oven and bake for another 10 minutes. Place foil on top of quiche to prevent crust burning, and return to oven for a final 10 minutes or until quiche sets. Remove from oven, and insert toothpick into center of quiche to check doneness. Let quiche stand for 5 minutes prior to serving. Do not serve your husband/wife/significant other first, particularly if they don't see a plate in your hand with your own portion. They might become worried. Reassure significant other that you, too, are eating the quiche. Take a healthy bite to assuage their fears. 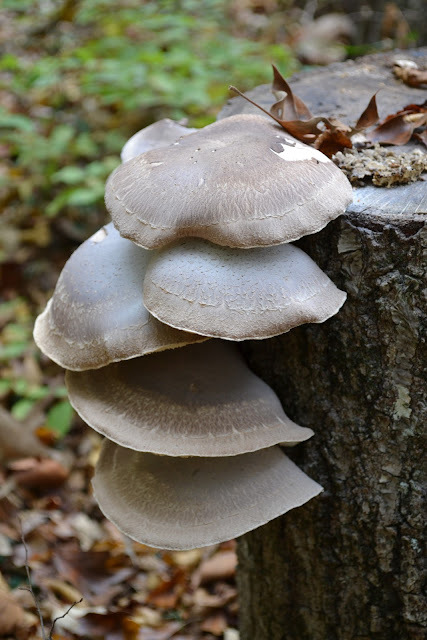 After eating, check your vital signs periodically to ensure you really harvested edible mushrooms. Do the happy dance when, after 7 hours, everyone is well. Start looking for more shiitake recipes. Realize that hubby will no longer receive my mushrooms when dining out, because-- who knew?—mushrooms are pretty yummy. 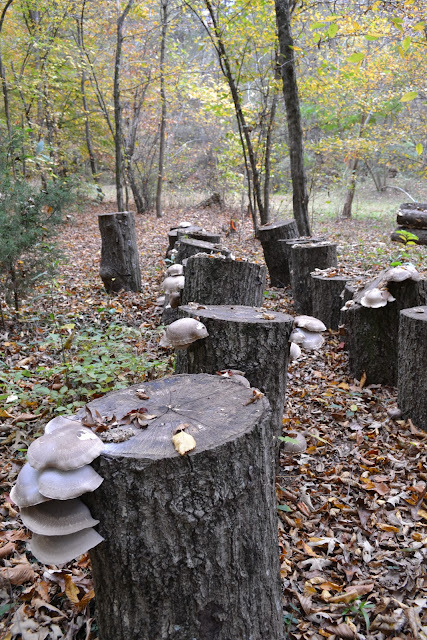 Because our mushrooms grow on very large logs, we should be well supplied for years. 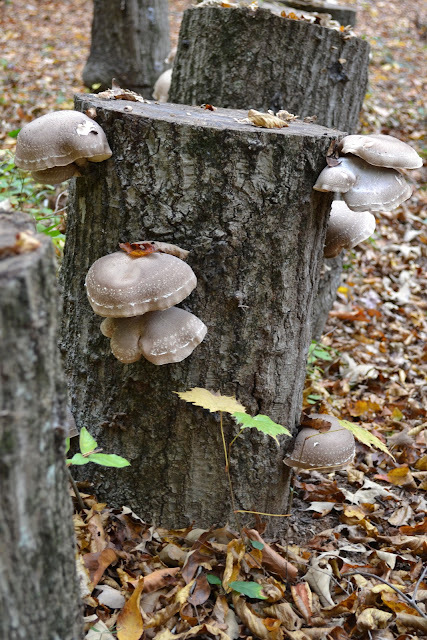 The logs require a period of rest before repeat fruiting, which is fine—we have plenty of shiitakes for awhile. Plus, shiitakes can be frozen or dehydrated for storage. Now, I need your help...please! What's your favorite mushroom recipe? I still have two and a half bags of mushrooms in the refrigerator, plus more to come. Risotto will definitely be in the lineup, but I'd love to know your favorite ways to use mushrooms. Not only are Tradd and Olga brilliant, they also offer great information and everything you need to grow your own mushrooms. Who knows? Now that our shiitake experiment succeeded, maybe I'll sign up for wild mushroom foraging with Mushroom Mountain. Or maybe I'll rest on my laurels and stick with the shiitakes.